​Twisted by his advancing years and a greed for money, this Christmas Eve Ebeneezer Scrooge will be given a second chance to get his priorities straight when he is visited by three spirits – Christmas Past, Christmas Present and Christmas Future. Using a mix of drama, dance, singing, choral work and puppetry, this adaption by Neil Bartlett uses the words of Dickens himself to bring this inspirational Christmas tale to life. The XtrAct Performance Group brings to life a production that will speak to young and old alike. It’s a family event to kick of the festive season. 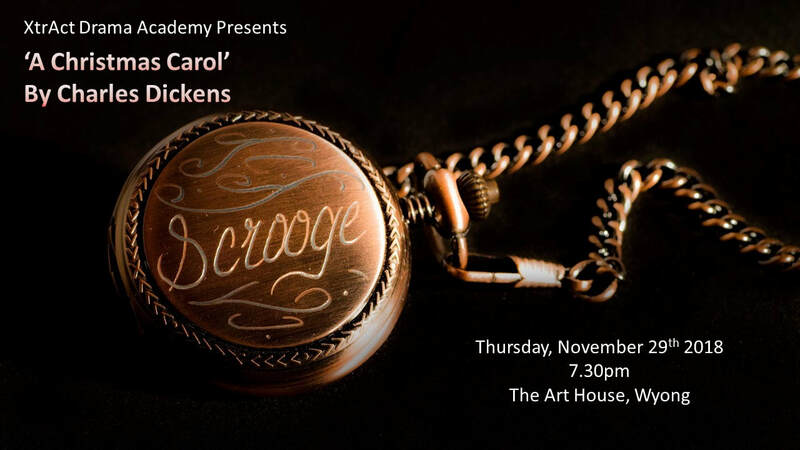 For More Information and Tickets click on Scrooge's Fobwatch. Current XtrAct students and their immediate families are invited to join us at Doyalson RSL on December 15th for our end of year performance and party. We're so proud of the XtrAct Performance Groups showing in 'Short Cuts' at Jopuka's Whatever Theatre Festival, April 19th - 20th 2018 at the Youth Arts Warehouse in Gosford, and Danielle had a brilliant time running the directing masterclass with some very talented young people. Our next performance is on June 30th at Wyong High School where both our junior drama classes and the XPG class will be entertaining our family and friends in a show called "INANIMANIA". We encourage students to appreciate the lifeskills gained from going to auditions, whether they win the role or no. Since 2015 all junior class term four performances have been community service focused. As December is a busy time for everyone, and encompasses the season of giving, we attempt to embrace the spirit of peace, family, community connection, and giving through our performances. Last year we attended local nursing homes. This year we will be entertaining children at some local after hours care facilities and our San Remo class will be providing the entertainment at the San Remo Neighbourhood Centre Christmas Party. The kids are well into rehearsing and are excited to be sharing their love of drama with the community. 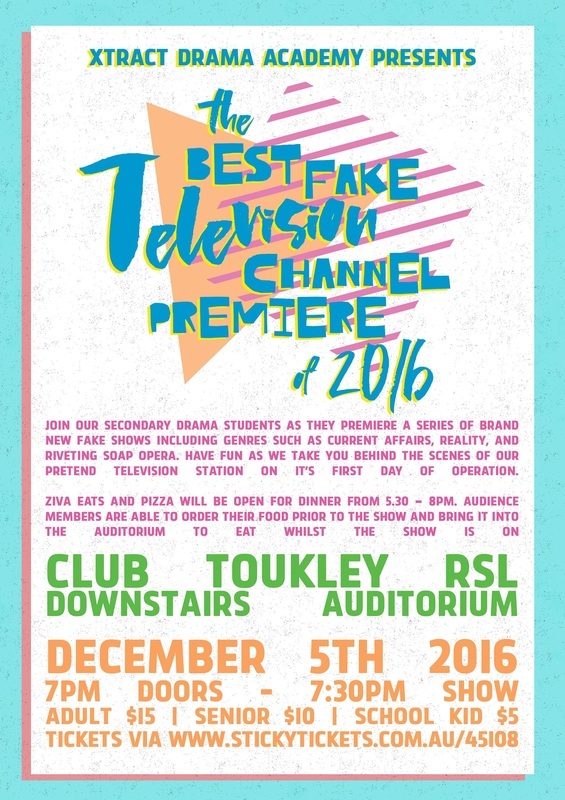 Join our secondary drama students on December 5th as they premiere a series of brand new fake show including genres such as current affairs, reality, and riveting soap opera. Have fun as we take you behind the scenes of our pretend television station on it's first day of operation. We'll be providing students with an opportunity to enrol in the Central Coast Eisteddfod during the September school holidays. Watch our Lower and Upper Drama students have fun onstage and display the performance techniques they have learnt during semester one. Our Secondary Drama students and Musical Theatre Students will be performing short one act plays and individual musical numbers to entertain and provoke. Come along to the Gosford Show April 30th and see some of our Senior Students entertain the crowds. Junior XtrActors and Musical Theatre Students - Performing for Community Groups around the Wyong Shire as our Christmas gift. Senior XtrActors - ​​​A Gala night of entertainment at Toukley RSL. Be entertained in an interactive theatrical experience celebrating a year of achievements and 10 YEARS OF XTRACT DRAMA ACADEMY. November 28th @ Wyong Aged Care. Students arrive 4.30pm for class and rehearsal. Junior Concert - "From the Page"
Senior Concert - "A Likely Affair"
Through a series of short dramatic scenes from contemporary and classic published works, students will demonstrate performance techniques explored during semester one. This December we will have two separate performances. Both shows take place at Wyong High School Hall (entrance via Jennings St). More information about our next performance for XtrAct parents and students . Our first major performance this year will be on August 2nd at Wyong High School. Kick off time will be 1pm sharp. As with the Wyong Theatre Fest (postponed until 2015 due to the demolition of Wyong Memorial Hall) we will have adjudicators and awards. Any small businesses wishing to sponsor one of our awards are asked to ﻿email Danielle﻿. XtrActors participate in two major performances a year. The first is fondly known as JuMP Night (Junior Mini Performances). JuMP Night kicks of the Wyong TheatreFest and generally occurs in late June each year. On JuMP Night students are treated to feedback from the festival adjudicator and get a taste of the festival atmosphere. Read Karen Ractliffe's review of this years JuMP Night and TheatreFest here. During early December each year we have our end of year performance day. Performances tend to swim around the theme of Christmas and pantomime at this concert and the onus is on celebrating a year of skill building. All of which culminates in a visit from Old Saint Nic. Check out information for 2013 Concert here.